CorePhysio: Keep moving, gain traction--don't let winter slow you down! The temperature is dropping, the rain is falling, and snow is beginning to dust the mountains. Winter recreation brings its own beauty and challenges. Cool, crisp runs; wet, gray bike rides; and snowy adventures delight outdoor enthusiasts and require increased safety knowledge. Whether it is a run in town on damp muddy trails, snowboarding at Mt. Baker, or skate skiing in Manning Park, staying safe during cold weather recreation is important. The combination of cold air or water temperature and wind necessitate adequate preparation and knowledge. This article will outline a few tips to consider while staying active during the winter months. According to CDC.gov, up to 2.8 million adults fall each year, with 1 out of 5 sustaining an injury. Wearing appropriate footwear and being aware of ground conditions is essential to avoiding slip and fall. Winter shoes with a toothy Vibram sole enable traction on slippery surfaces and refrozen crud. Remember that short of carbide spikes, no shoe can guarantee safe passage over unexpected ice. Stock up on snow shovels and de-icer before you need it: clearing pathways and de-icing is the first, best thing to reduce risk of outdoor falls for you and those you love. Staying hydrated during winter recreation is vital. It may be challenging to remember to drink water when the temperature is low. Depending on the temperature, an insulated water bottle may be necessary to avoid freezing. Warm non-caffeinated tea is another great way to maintain hydration. Daily recommendation of around 2.5 liters of water per day is a general recommendation and water consumption should be increased with physical exertion. Being well hydrated can also ward off mild hypothermia. 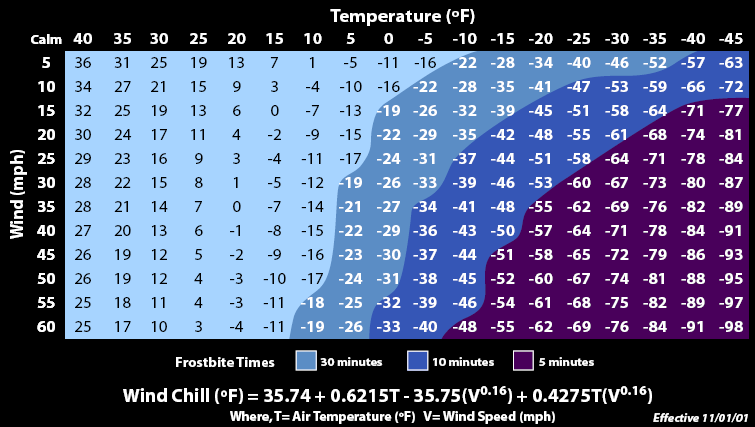 Wind has a dramatic effect on perceived temperature and can quickly increase the risk for frostbite (see the chart below). Wearing hats, gloves, windproof layers, and face protection can help mitigate the effects of wind chill. Back country snow adventures on ski, snowshoe, and snow machine require knowledge of avalanche safety. The Northwest Avalanche Center’s website has information regarding current conditions and educational material at https://www.nwac.us/. If your adventures take you to the backcountry, make sure you are carrying the 10 essential, have plenty of warm clothing in case of an emergency, and feel confident in your avalanche safety knowledge. Bundle up in sweat wicking clothes that can be layered to adjust to body temperature and exertion level. It is important to not overdress as the body warms up because sweating will cause more rapid evaporation of body heat. A change of clothes left in the car is helpful to decrease chill when driving home from an adventure. Rain gear with ventilation can assist body temperature regulation while sweating in the rain. A muscle that is cold contracts with less force and fatigue may occur more rapidly. Increase your warm up and cool down times to avoid strain. Winter recreation opportunities add to this special season. If an injury or physical discomfort is holding you back from jumping into your favorite winter activity, talk to your local physical therapist. Physical therapists are especially suited to provide musculoskeletal advice and assist in returning to full participation in your favorite activity. The physical therapists at CorePhysio enjoy winter activities themselves! The avid runners, bikers, skiers, and snowshoers at CorePhysio would be delighted to work with you to help you return to your favorite winter sport. Enjoy the season and stay safe! Cappaert TA, Stone JA, Castellani JW. National Athletic Trainer’s Association Position Statement: Environmental Cold Injuries. Journal of Athletic Training 2008; 43(6):640-658. Kennedy WL, Wilmore JH, Costill DL. Exercise in Hot and Cold Environments. Physiology of Sport and Exercise. Champaign IL, Human Kinetics. 2012.